asking for safe passage across the dangerous North Sea. 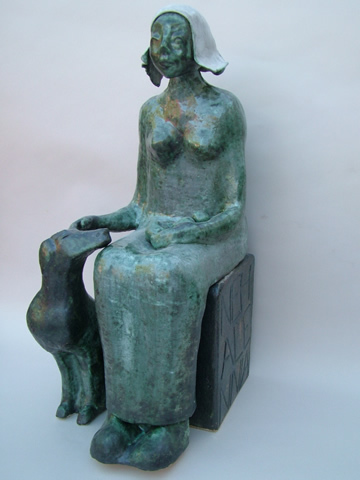 Probably from Celtic origin, the female figure is almost always depicted seated on a throne, accompanied by a dog and fruit on her lap: symbols of faithfulness and fertility. She is the seafarer's Mother-Goddess, symbol of protection and security. She is the mythical image of the mother-fixation. Professor Dr Cornelis in his "Logic of Emotions" introduces Nehalennia as one and the same as Neeltje Jans, an even older name known in the southern island region of the Netherlands. Neeltje Jans is the sandbank in the Eastern arm of the river Schelde, now offering a secure base for the revolutionary storm surge barriers that were built after the terrrible February 1953 floods, that devastated the southern parts of the Netherlands. The Delta Works based on Neeltje Jans, this triumph of hydraulic engineering, now offer security and protection from the continual threat of wind and water. Nehalennia, little goddess from far before this era of technology, cannot be forgotten and is revered until this day. Dimensions: 12" x 17" x 30 "